Add the remaining Prima Coconut Premix into pot and mix well for about 10 mins before end of cooking time (refer to Variation below on different estimated cooking time). Continue to simmer till gravy is slightly thickened and glossy to desired texture and taste. Serve with warm rice. You may marinate beef in a container with whole packet of Rendang Paste (at least 12 hours in chiller), for a more robust taste and you may use meat such as chicken and lamb instead of beef. This product contains: Soybeans, Wheat, Tree Nuts, Milk Products. Manufactured on equipment that also processes peanuts, crustaceans, fish, celery, molluscs, sesame and egg products. Ingredients: Rendang Paste: Heat Sterilised Vegetable Oil (Palm Olein), Galangal, Water, Palm Sugar, Onion, Shallot, Sugar, Dried Chilli, Pandan Leaf (Pandanus Amaryllifolius), Garlic, Ginger, Candlenut, Salt, Curry Powder (Fennel, Cumin, Coriander, Turmeric, Clove, White Pepper, Cinnamon), Lemongrass, Soya Sauce (Extract Of Soya Bean, Wheat Flour, Salt, Water, Sugar, Colour (Ammonia Caramel), Chilli, Kaffir Lime Leaf. Prima Coconut Premix: Coconut Milk Powder (Coconut Milk Solids, Maltodextrin, Sodium Caseinate), Maltodextrin. 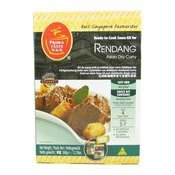 Simply enter your details below and we will send you an e-mail when “Rendang Asian Dry Curry Sauce Kit (亞洲乾咖喱套装)” is back in stock!